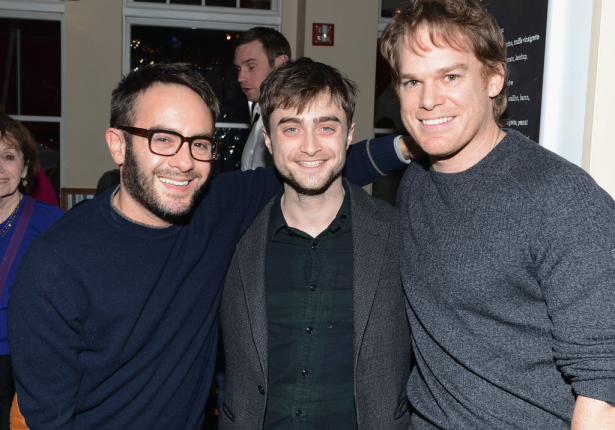 via TV3: Daniel Radcliffe and Michael C. Hall enjoyed confusing Dexter and Harry Potter fans and they "freaked people out" by hanging out together. The actors have both played iconic characters, with Michael portraying Dexter in the popular TV series and Daniel starting his career as Harry Potter in the wizard franchise.Starring alongside each other in Allen Ginsberg biopic Kill Your Darlings means the two recognisable faces often spent time together - much to the amazement of fans. "Michael and I hung out a bit, and when we were together, it definitely freaked people out, because we didn't have trailers on this film set, so we were just hanging out on sidewalks and stuff," Daniel laughed to Collider. "People were walking by and going, 'Is that that Harry Potter guy and Dexter chatting over there?' I do think we freaked a few people out but, I like to think we sort of run blocking for each other." Since starring as the boy wizard, the 24-year-old has branched out into edgy projects such as Horns and The Woman in Black. Daniel has found it a challenge to shake his Harry image, which is something Michael can relate to. "Also, it was nice for me to talk to Michael because he is in a much later stage in his career, and he'd done loads before he ever did Dexter, but he is in a similar position," he explained. "He has a huge amount of attention for one thing. He probably gets called Dexter as much as I get called Harry Potter, so it's nice to just talk to him about that and see how he handles it, which is quite similar to mine. It doesn't really bother him. He's obviously very proud of Dexter, and I'm very proud of Harry Potter. But yeah, it's always nice to talk to somebody who's in a similar boat."